Some of my favorite moments with my oldest daughter have been when I find her using her imagination. She is usually talking to herself, making up a story or replaying a tale like Little Red Riding Hood or one from her most recent favorite TV show. When I find her like this she usually has picked up something lying around to use in her play. This is why I’ve found having a few key items available important for fostering creative play. Creative play is defined as any play in which the person uses their imagination or creativity. This can encompass dress up and dramatic play as well as coloring or creative projects. For children, play is extremely important in their development, and creative play is no different. Here are some of the benefits of creative play. Social skills – Since many time pretend play occurs when more than one child, the children will be playing together. Through their collaborative play, they are also working on their interpersonal skills. Engages all senses – Creative play engages a child’s senses. If they’re making a fort with clothespins they’re using their fine motor. While they’re pretending to be a frog, their gross motor skills are engaged. If they’re a pirate on the high seas, they’re pretending to look through a spyglass with their vision. Deal with difficult situations – One of the best aspects of creative or imaginative play is that children can take risks and deal with challenging scenarios without the repercussions. This is how they learn to navigate and work through some difficult situations that have been bothering them. I’ve found that having these items in my house and readily available encourages my children to engage in creative play more. The below are either free or already in your house. Big or small, a piece of fabric can transform into anything – a cape, a tent, a picnic blanket. By having clothespins on hand you can easily make a play fort. If looking for fabric to dedicate for creative play, look for playsilks like Sarah’s Silks. 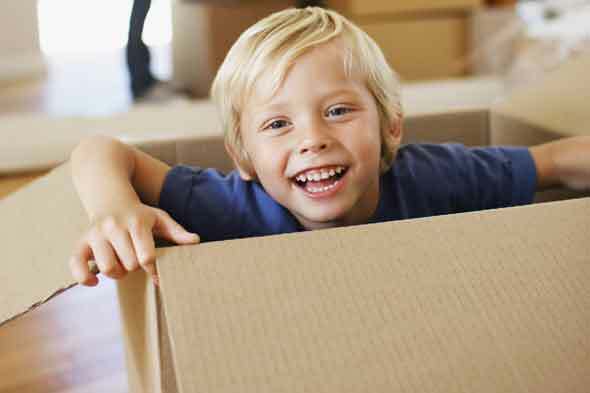 Depending on the size, a cardboard box can be anything from a pirate ship to an astronaut helmet. If you have smaller children like me, you’re buying tons of diapers and diaper boxes are versatile. You don’t need a fancy kids kitchen set or tea at to engage in food related pretend play. A cup and spoon can open up many possibilities. There’s always the old classic wooden spoon and pot that instantly turns any kid into a rock and roll drummer. Kids love laundry baskets and the sturdiness of plastic baskets can give your child many avenues for creativity. Leaves are instantly bouquets and sticks are wands with magic powers. The best thing is they are both free and found in abundance! Drawing utensils can turn any paper object magically into something else. A paper bag turns into a puppet and a paper plate into a mask. Colleen is a marketer but day and parent to two little girls by night. She has a background in visual arts which means creating with her little ones is her favorite activity. She runs kinesthetic-kid.com with her husband who is a special education teacher. This post originally appeared here. To read more from Colleen, find Kinesthetic Kid here on Twitter, Facebook, Instagram or Pinterest. Next Next post: What Are Phonics? Some great suggestions, the cardboard box is an absolute winner which we have had many hours of fun with our daughter after adding some creativity to it 🙂 From a social skills point of view, I found that interaction with other kids is extremely important for building social skills and confidence (where you have just one child like we do). Nursery has helped a great deal with her speech and also with interacting with other kids, I would definitely recommend it even if it’s just for a few hours a week (nurseries are super expensive! ).